Karl Alzner has played 789 regular season and playoff games as a professional hockey player in the NHL and AHL. All of them were played as a member of the Washington Capitals organization. Only 19 players in franchise history have appeared in more regular season games with the Caps than Alzner (591). With the end of the 2016-2017 season, though, Alzner becomes an unrestricted free agent for the first time in his career. So, in a walk year, did Alzner distinguish himself? Well, yes and no. If one thinks of a distinguishing year as one that is significantly better than a player’s pattern over a career, then no, Alzner did not have a distinguishing year. Rather, he has a year that was distinguished by its being very much like those that preceded it. In six full seasons with the club prior to this one, Alzner did not miss a game and had a scoring line of 3-14-17, plus-7, per 82 games and averaged 20:30 in ice time. In 2016-2017 he played in all 82 games once more and was 3-10-13, plus-23, while averaging 19:47 per game. It was very much an “Alzner” sort of year. But underneath what was a season that looked like any other in his career, Alzner did have his ups and downs. He started hot, by his standards, posting a pair of goals and a pair of assists in his first ten-game split. Then, he went silent at the offensive end. Never what one would call an offensive defenseman, he not only went without a point in his next two ten-game splits, he was a minus-1 on a club that went 12-6-2 in those games and had a goal differential of plus-10. Like the rest of the club, Alzner had a productive stretch in Games 31-60. While the team was going 22-4-4 with a plus-61 goal differential, Alzner was 1-7-8, plus-20. But as productive as he was in that 30-game stretch, he fell silent again down the stretch, going 0-1-1, minus-2, in his last two ten-game splits (12 games in the last one). 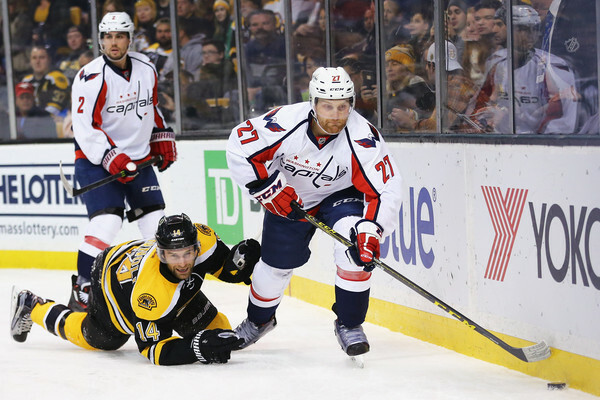 Fearless’ Take… Minutes mattered for Alzner. The Caps were 33-3-4 in games in which Alzner logged at least 20 minutes of ice time, 22-16-4 when he skated fewer than 20 minutes. And there is this thing about blocked shots with Alzner, and his ability to perform that skill accompanied Caps wins this year. Washington was 21-5-0 in games in which Alzner blocked at least three shots; they were 8-5-1 in games in which he did not record a blocked shot. Cheerless’ Take… While defense is Alzner’s stock and trade, being physical is not. He was credited with at least three hits in 14 games this season, but the Caps were just 8-4-2 in those games. They were 17-6-3 in games in which he was not credited with a hit. Odd Alzner Fact… The Caps were just 1-2-2 in games in which Alzner recorded three or more shots on goal, 20-4-1 in games in which he recorded no shots on goal. For a defensive defenseman, points come rarely, and success comes in other ways. That was the case for Karl Alzner in a late season contest in Toronto against the Maple Leafs. The game had more meaning for the Leafs than it did for the Caps, Toronto seeking to clinch a playoff berth while the Caps were trying to stay sharp for the postseason. The Caps methodically wore the Leafs down, scoring single goals in the first and second periods and then adding a pair in the second. Meanwhile, Alzner and the rest of the team were stifling the Leafs in the offensive end. Only a power play goal by Mitch Marner with less than two minutes left spoiled the shutout. For Alzner it was a plus-3 night, one of five during the season in which he was plus-3 or better. He also had an SAT (shot attempt share) of 71.43 percent for the game, best on the team. The Caps went to Pittsburgh on January 16th hoping to sweep a Pennsylvania back-to-back, having shut out the Philadelphia Flyers in Washington the previous night, 5-0. When the Caps took a 2-0 lead into the first intermission, a sweep was looking good. When Justin Williams scored less than two minutes into the second period, it looked even better. Then, the bottom dropped out of the game. Pittsburgh scored five goals in 8:09. Alzner was “only” on ice for two of those goals, but it was a tectonic shift in momentum. The Caps did score a pair of goals less than two minutes apart to tie the game, 5-5, but Pittsburgh got a power play goal from Evgeni Malkin – with Alzner on the ice – to take the lead into the third period. Pittsburgh took a two-goal lead early in the third – Alzner getting another up close and personal look – to seemingly put the game out of reach. Washington scored twice, though, to salvage a tie through regulation. Alzner was spared another close look at a Penguin goal when Pittsburgh scored 34 seconds into overtime, but Alzner finished minus-3 for the game (his worst rating of the season) and had an SAT of just 36.36 percent. Karl Alzner skated in the first two games of the postseason, extending his personal streak to 599 regular season and playoff games played. The streak did not reach 600. Alzner sat in Game 3 of the opening round series against the Toronto Maple Leafs with an upper body injury (later disclosed as a broken hand) and would not reappear on the ice until Game 3 of the second round series against Pittsburgh. He could only skate in a limited role, though. After logging 21:34 in ice time in a 3-2 overtime win in Game 3, he skated just an average of just under 11 minutes a game over the last four games of the series. By series end he was reduced to 8:42 in ice time. Only once in his career did he skate fewer minutes in a postseason game – 5:16 in Game 6 against these same Penguins in Game 6 of their 2016 series, a game Alzner left early with an injury and that the Caps dropped in overtime to lose the series to Pittsburgh. Evaluating defensive defensemen is not easy. However, while for the most part, 2016-2017 was an “Alzner being Alzner” sort of season, one had the feeling that it leaned toward the lower end of that scale. His SAT (47.32) was under his career average since 2009-2010 (48.89), but not by a great deal. His scoring was off in total, but it was a product of a lower assist total than his average. 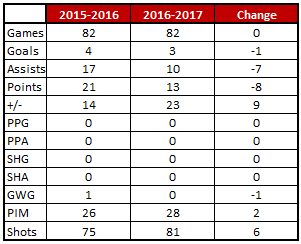 His blocked shots were down significantly from his 207 in 2015-2016, but 162 blocked shots was still the third highest of his career. His credited hits were down, but again the 105 he had (135 last season) was the third highest of his career. Where he did fall off was in his ratio of takeaways to giveaways. Even acknowledging the arbitrariness of what constitutes a takeaway or a giveaway, his 0.33 mark was the second worst of his career (0.28 in 2008-2009, his rookie season). What he dealt with late in the season – a broken hand – no doubt diminished his effectiveness, although this is a problem he’s had repeatedly over his career. It made for a second straight injury-driven disappointment for Alzner, who had to leave Game 6 against the Penguins in 2016 due to an injury and watch the Caps be eliminated from the sidelines. As disappointing as last year was, this season’s end might be more so. Alzner is an unrestricted free agent, and it is at best uncertain whether he will return. Only seven defensemen in team history have played more games than Alzner. The odd part of the list is that only one of them (Rod Langway) ended his career in a Caps uniform once they arrived here (Sylvain Cote did two different tours with the Caps). It might be that Alzner, who has never known another organization, the beginning is, at long last, at an end.